The analysis below is not meant to be a full or general analysis of a personality because it focuses only on the dangerousness potential. The information provided in the manual should be used only as a tool to validate or supplement the usual methods that the law enforcement, security, and mental health field professionals are currently using. The style of this analysis is annotative and provides references in red, (e.g. "D-13") to passages within the analyst's book "Danger Between the Lines". We also have a link to a narrative version, but which lacks the specificity of the annotated reference. The graphological indications are highlighted in blue and italicised. To view a narrative description of this analysis, click on the word "narrative" in the abstract. At first glance the signature seems like an average handwriting sample, much as the man may have appeared. On closer examination, the writer has subtle, negative combinations that far outweigh the positive or inhibiting qualities. With only a signature to work with we are seeing the man only at this obviously very disturbed time in his life. You can click on narrative to view a partial profile as derived from this analysis. Psychological implications: Indicates inappropriate release and utilization of mental, emotional, and/or physical energies. The personality tends to be lacking in resilience and elasticity, since the upstroke suggests a forced expression of energies. Sometimes the writer has trouble expressing himself in a "normal" sexual manner and may direct libidinal forces into external activity. Such activity can be explosive if the upstrokes are especially heavy and if accompanied by other dangerous signs. Psychological implications: Irregular baselines indicate moodiness. This suggests immaturity and labile, unpredictable reactions and behavior. If the baseline is very wavy, the writer may fluctuate between conscious and subconscious material, or between fact and fantasy. Psychological implications: Highly irregular pressure suggests erratic impulses and uncontrolled emotional responses and urges. Sudden bursts of energy (often sexual) occur according to the preponderance of pressure fluctuation. The writer is apt to be emotionally labile, sometimes nervous. Check for health problems, such as physical exhaustion, emotional problems, and possible psychosis (if extreme). Psychological implications: Loops or circle letters that have a squared or angled look suggest a lack of sensitivity to others' feelings and may indicate a harsh, crude, and/or brutal individual, when found in combination with other indications of dangerousness. Angled circle letters also imply internal tension or frustration. Psychological implications: X formations in the handwriting show the writer likes conflict and competition. This fighting spirit may be on an intellectual level if the writer is educated or of refined tastes; if not educated or if more physically-oriented, the writer will be inclined to fight on a physical level. X formations may also indicate thoughts, worries, or fantasies about death, either regarding other people or the writer himself. If this is noted repeatedly, it may indicate a pervasive characterological attachment to thoughts about death. X structures in the upper zone are generally less dangerous than when found the lower zone, unless other intensifying signs are present. An X-ed signature or personal pronoun I is especially significant. Psychological implications: Tics suggest anger, hostility, irritability and frustration, depending on their relative strength when compared to other writing strokes. They suggest the tendency to easily lose one's temper, according to their frequency, and especially on the amount of pressure used in writing the stroke. The writer of tics has a short fuse and can fly off the handle at the least provocation. With other negative indicators and with lack of control strokes, this is an especially violent sign. When tics are seen in the personal pronoun I and/or signature, a pervasive characterological anger (conscious or unconscious) is suggested. Such tics indicate a disturbance in the person's self-concept, depending upon the nature of the distortion. Psychological implications: May indicate hidden aggression or sneaky, behind-the-scenes activities. The person has a beneath-the-surface, covert, subtle, indirect approach. These strokes connote psychological understanding of unconscious motivations, which can be utilized either positively or negatively, depending on other signs. It is sometimes seen in the writing of detectives, vice squad, spies, therapists, or criminals. Psychological implications: Thinking and morals may be distorted or strange. The writer may twist ideas or morals to fit his behavior or to justify his actions. Psychological implications: Handwriting that increases in size suggests a verbally blunt person-someone who lacks tact. It points toward a lack of refined social skills and implies that the writer attempts to overcompensate for a basic feeling of inferiority. If the change in size occurs rapidly, it may indicate instability and/or a tendency to suddenly lose control, depending upon the frequency and intensity of the size increase. When final letters suddenly grow large, the writer is apt to express his opinions strongly and may want to have the last word. Psychological implications: A tendency to become increasingly emotional and less objective as the writer becomes more involved with a person, project or activity. If such a writer is prone to criminal activity, he is likely to start out cool but he soon loses his level-headedness and gives way to feeling. Psychological implications: Uphill baselines indicate a positive mood and an optimistic outlook. If the lines rise steeply on the page, the person may be restless, manic, or perhaps unrealistically optimistic. Rising lines add to energy and ambition. Uphill baselines add energy to the person's expressions, whether positive or negative. Psychological implications: Suggests unmet emotional hunger often resulting in covert "using" of other people. Connotes devious behavior, manipulation, and indirect communication. The person is cunning, astute, crafty, or sly and may use sneaky maneuvering to get his "hooks" into you. This is characteristic of people whose business it is to profit through other people's credulity-confidence men, for example. When a naive person and a shark's tooth writer meet, the former is in for some quiet, systematic, and pitiless bloodletting. The shark's tooth can bite. Psychological implications: Strokes that have a decidedly forward thrust imply aggressiveness and/or initiative (forward movement). The heavier and longer the thrust, the more energy is denoted. When a forward-thrust stroke is seen above the baseline, mental initiative is usually suggested. Physical aggressiveness is implied when the stroke thrusts forward below the baseline. Writers of such strokes employ considerable energy in their activities, whether positive or negative. Psychological implications: Unique or unusual handwriting formations indicate an unusual thinking style. Unique thinking can be a blessing or a curse, depending on other handwriting characteristics, which must be evaluated carefully. It may indicate talents and uniquely creative abilities OR pathological obsessions, especially when found consistently; the writer may be "crazy" or creative. The individual's thinking, philosophy, and/or behavior may be altered to serve his or her own emotional needs. Psychological implications: Suggests vanity, an overestimation of one's own worth and abilities. The person expects praise and recognition, whether it has been earned or not, tends to think that rules do not apply to him, and may exhibit pomposity, grandiosity, or arrogance. He or she is defended, susceptible to flattery or criticism, and may criticize other people in order to look "better than." Psychological implications: Prone to acquisitiveness-a desire to possess. Small hooks indicate trivial desires, while larger hooks indicate large or global acquisitions. If this is a relatively strong trait, it might imply ambitious desires. When negative traits are suggested, acquisitiveness, if strong enough, could be motivation for crime. Psychological implications: Unstable mid-zone size suggests a proneness to hypersensitivity which relates to a fluctuating self-image. Unstable responses and inner conflict are implied. The writer is easily affected by outside influences and may therefore be a "barometer" for the feelings of others. When the midzone size is erratic and signs of dangerousness are present, the person will be unpredictable in the expression of his criminal behavior. 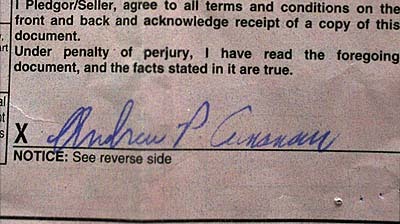 Mr. Cunanan s signature, as utilized for this evaluation, came at a time when he was on the run, at a time when his life was considerably disturbed. It reflects his personality and behavior at this critical juncture so that elements of his behavior could have been modified in other situations or at other times. At first glance the signature of Mr. Cunanan seems average, much as the man may have initially appeared to others. On closer examination, the writer had subtle, negative combinations that far outweighed the positive or inhibiting features of his personality. With only a signature to evaluate we are seeing this man at an obviously very disturbed time in his life. Other disintegration of controls could be reviewed with more samples of his writing. Specifically Mr. Cunanan had the type of personality that was lacking in resilience and elasticity. There were indications of inappropriate release and utilization of mental, emotional and/or physical energies. Sometimes such an individual has trouble expressing himself in a normal sexual manner and may direct libidinal forces into external activity. Such activity can be explosive if accompanied by other dangerous signs within the personality. Mr. Cunanan s writing at the time of this signature indicates that he was moody, immature and labile, with unpredictable reactions and behavior. At times he could fluctuate between conscious and subconscious material, or between fact and fantasy. Erratic impulses and uncontrolled emotional responses and urges could be exhibited. He could act with sudden bursts of energy (often sexual). At times he could be nervous, a condition resulting from physical exhaustion, emotional problems and possible psychosis. A certain lack of sensitivity to others feelings and indications of a harsh, crude, and/or brutal individual is exhibited in this writing, particularly when reviewed with other facets of his personality indicating dangerousness. He liked conflict and competition, with a fighting spirit either intellectually or physically, at the same time there are indications of thoughts, worries or fantasies about death, either regarding other people or himself. There are signs of a pervasive characterological attachment to thoughts about death. Anger, hostility, irritability and frustration are reflected in this signature. There is a suggestion that he could easily lose his temper, exhibiting a short fuse so that he could fly off the handle at the least provocation. With other negative indicators in the personality these characteristics are particularly violent signs. At the same time there were disturbances in his self concept. 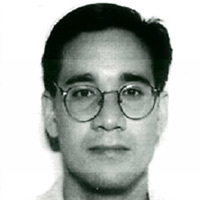 Mr. Cunanan had a tendency toward hidden aggression or sneaky, behind-the-scenes activities. His approach was covert, subtle, and indirect, with a psychological understanding of unconscious motivations, which he could use either positively or negatively. This type of covert understanding and approach is sometimes exhibited by detectives, spies or criminals. Unpleasant unconscious urges and desires affected Mr. Cunanan s value or belief system and behavior. His urges and desires could not be expressed or acknowledged openly, and therefore his actions were likely to be hidden and subversive. Thinking and morals could be distorted or strange, and he could twist ideas or morals to fit his behavior or to justify his actions. This individual could be blunt in his dealings with others, implying a lack of refined social skills and attempts to overcompensate for a basic feeling of inferiority. He would have been apt to express his opinions strongly and would want to have the last word. Compulsive tendencies are indicated in this individual s signature. His tendency would be to recognize cognitive information only, relying heavily on orderly and systematic thinking and not trusting his intuition. He had the ability to think strategically and could plod ahead doggedly. His acts were likely to be planned rather than expressed impulsively. He could have difficulty stopping once he was on a project or idea. He could become increasingly emotional and less objective the more he became involved with a personal, project or activity. He would likely start out cool but soon lose his level-handedness and give way to feeling. His behavior could be manic, restless or unrealistically optimistic. He had energy and ambition. There was, however, an unmet emotional hunger which could result in covert using of other people. This connotes devious behavior, manipulation and indirect communication. This person could be cunning, astute, crafty or sly and could use a sneaky maneuvering style to get his hooks into others. This is characteristic of people whose business it is to profit through other peoples credulity--confidence men, for example. Cunanan could be aggressive and expend considerable energy in his activities, whether positive or negative. He had an unusual thinking style, which for some can be both a blessing and a curse, depending upon other features of the personality. With some this unique thinking could be carried out in creative activities whereas with Cunanan this thinking could be pathologically obsessive. His thinking, philosophy and/or behavior could be altered to serve his own emotional needs. He was likely quite vain, overestimating his own worth and abilities. As a consequence he would expect praise and recognition, whether it was earned or not, tending to think that the rules did not apply to him. He would, therefore, exhibit pomposity, grandiosity or arrogance. He would be susceptible to flattery or criticism and could criticize other people in order to look better than He had a need to acquire things in rather large quantities and had ambitious desires. This acquisitiveness, as strong as it was, might have been his motivation for crime. This individual had a proneness to hypersensitivity which related to his fluctuating self-image. Unstable responses and inner conflict are implied in the signature. He could be easily affected by outside influences and could therefore be a barometer for the feelings of others. He could therefore be unpredictable in the expression of his criminal behavior. As noted earlier Mr. Cunanans signature, as utilized for this evaluation, came at a time when he was on the run, at a time when his life was considerably disturbed. It reflects his personality and behavior at this critical juncture so that elements of his behavior could have been modified in other situations or at other times. Kimon Iannetta is the founder of Trial Runs and has more than 29 years of experience in forensic/criminal behavioral profiling. She and co-wrote the book, "Danger Between the Lines, Resource Manual for Prediction of Violence," a guide for police, security and psychiatric professionals for the identification and assessment of dangerousness via handwriting. This months criminal profile is taken directly from the factors presented "Danger Between the Lines." It is based on a ten year study at the Hawaii State Hospital, to determine potential dangerous characteristics revealed in the patient's handwriting. It was a simultaneous evaluation of the patients by psychologists working there, using two different methods. The doctors used their normal procedures based on interviews, medical and criminal histories, testing, etc. The other evaluation (rating) was based solely on their handwriting samples. There was a high degree of correlation between the raters. Dr Craine then translated my understanding of graphology into psychological terminology and categorized the characteristics into three major areas: Facilitators, Dangerousness and Indicators.